Say you find yourself in the middle of an impromptu shopping cart race. Or in the dining hall when a colossal food fight breaks out. Now you can prove it really happened with the iPod nano video camera. Shoot high-quality video in portrait or landscape â€” perfect for posting on the web or emailing friends. 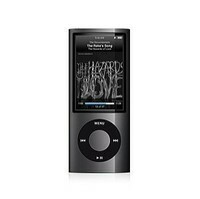 iPod nano also includes a microphone that captures clean audio you can listen to during playback on the built-in speaker.